This fine and impressive pair of antique Edwardian sterling silver and Mother of Pearl handled fish servers consists of a serving knife and fork. The anterior of the knife is embellished with bright cut engraved scrolling leaf and stemmed floral motifs amidst trellis designs paralleling the shaped side of the blade. 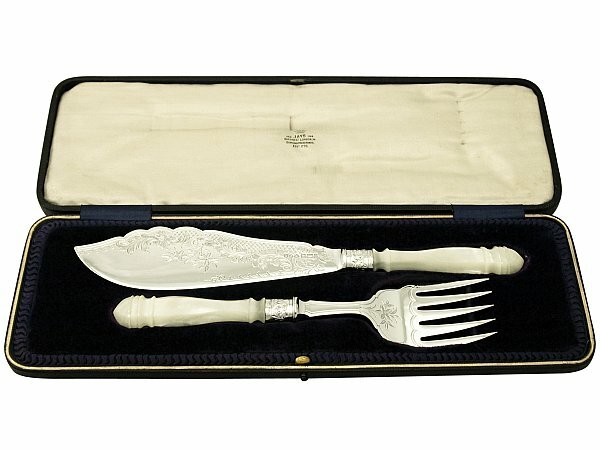 The drop of the fork is ornamented with a bright cut engraved floral and leaf design accented with a scalloped paralleling border. The posterior surface of each shaped blade is plain and unembellished. These sterling silver fish servers are fitted with fine and impressive faceted, carved mother of pearl handles with waisted knopped portions. Both servers have embossed undulating scrolling leaf decorated ferrules. These antique fish servers are fitted to the original hinged leatherette box with satin and velvet lined interior, which secures with a push fit catch. These antique fish servers are a very good gauge of silver, fine quality and in exceptional condition. Full hallmarks struck to the surface of each blade and ferrule are all very clear.